I am all about creating recipes that are seasonal, with ingredients that are showcased and available during that season. Summer is the season for tomatoes and especially Heirloom Tomatoes. Yesterday I came across these beautiful Mini Heirloom Tomatoes and decided to slow roast them, and make them into a tart topped with a bright fresh salad. If you can't find Mini Heirlooms, just thin slice (1/4") regular Heirloom Tomatoes (I'd use about 3 for this recipe) and roast them the same way. When roasting Tomatoes you're looking for them to just start to wilt and prune up a bit, and brown very slightly. 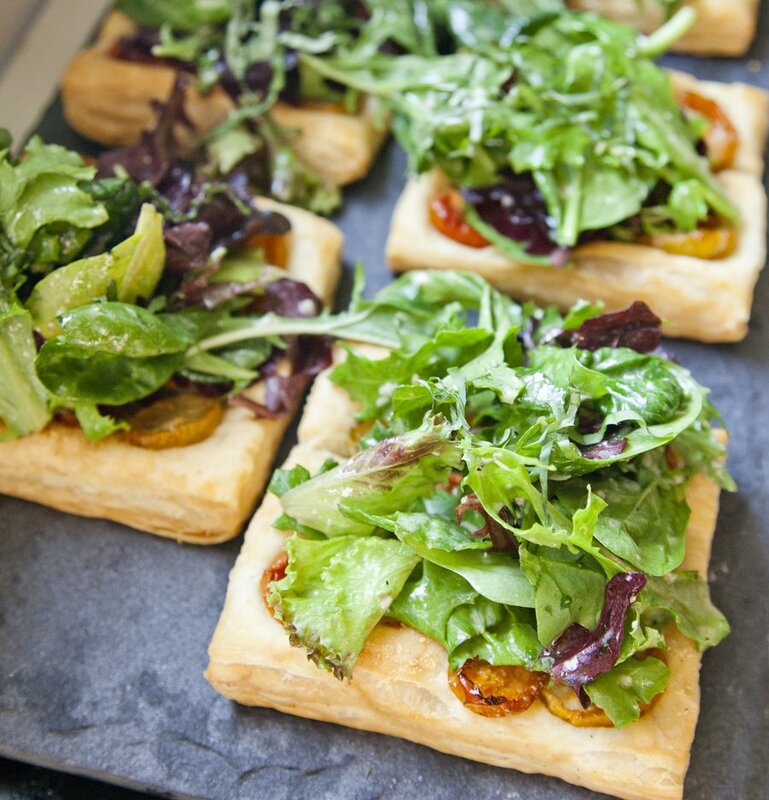 Roasting tomatoes brings out this incredible flavor that will turn non-tomato lovers into believers! You can also top this tart with some fresh Mozzarella, Burrata or Ricotta Cheese to give it a little more of an Italian pizzazz. Preheat your oven to 325 degrees. Cut all of your mini heirloom tomatoes in half, lengthwise using a serrated knife. On a baking sheet that has a resting rack on it, spread out all your tomatoes and drizzle with olive oil, salt and a little sugar. Bake in the oven for 1 hour. Remove. Increase the oven temperature to 375 degrees. 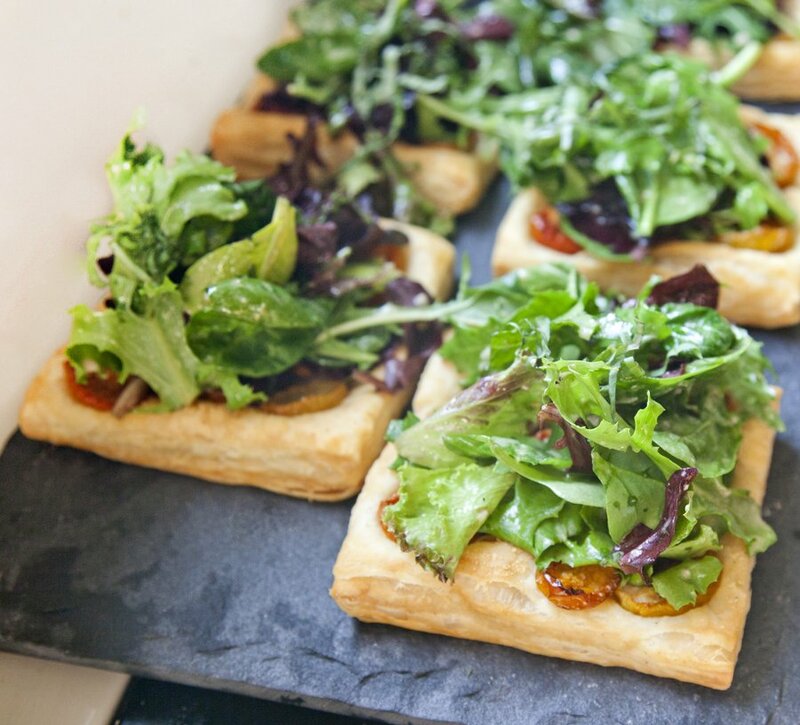 Take your puff pastry and cut it into 6 equal sized squares. 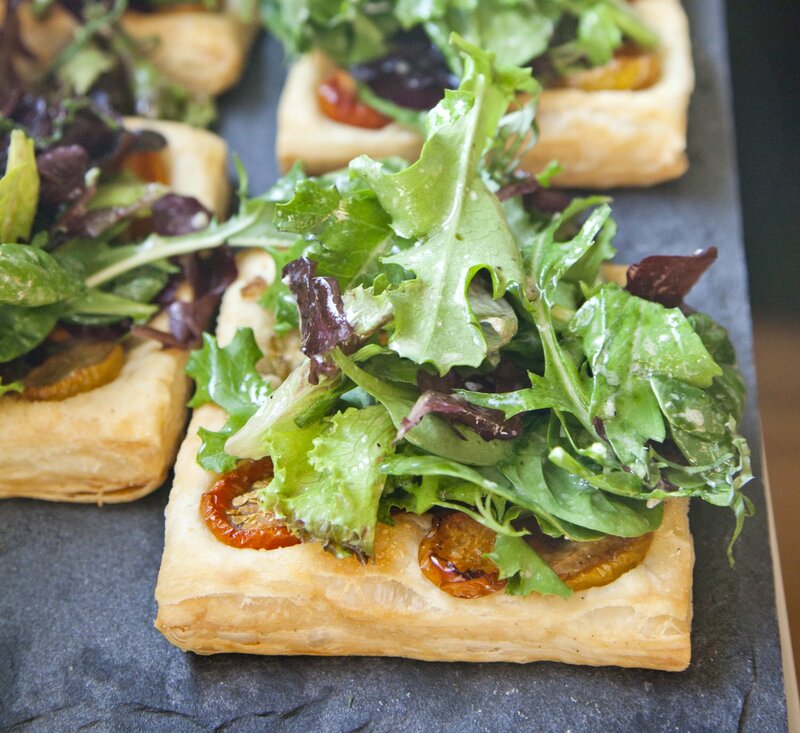 Place the puff pastry on a silpat lined baking sheet. 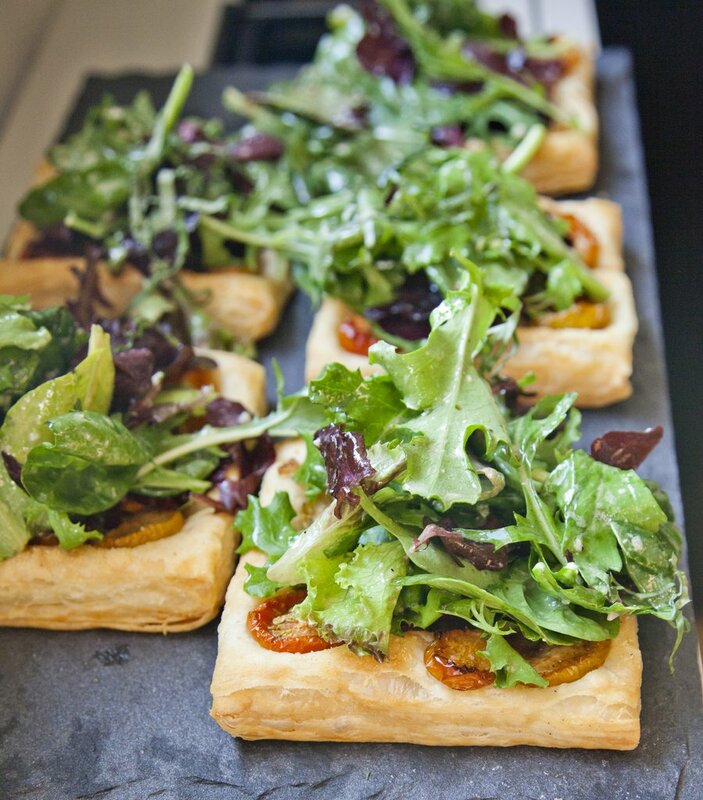 Top each square with the roasted tomatoes. Add to each some of your scallions and a little sprinkle of the grated parmesan cheese. Bake in the oven for 25 minutes. 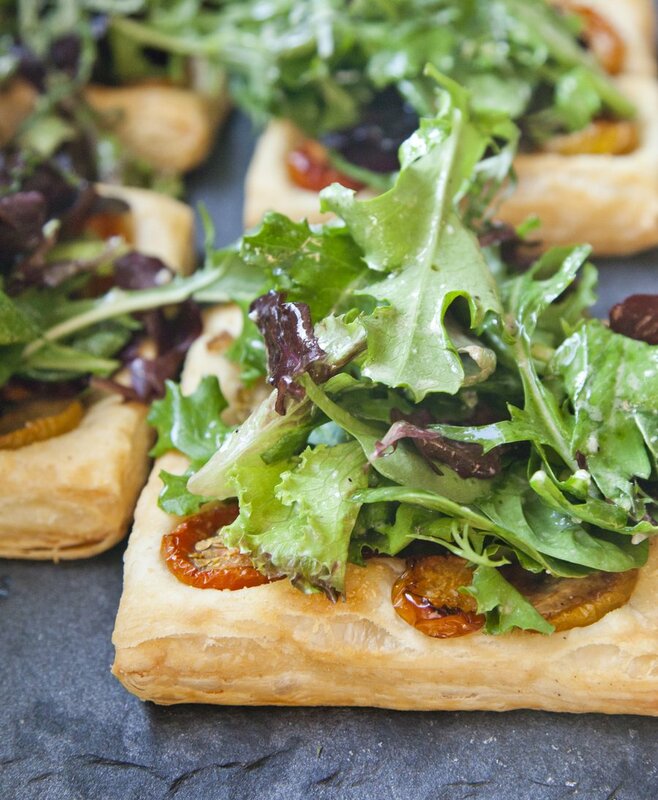 While the puff pastry is baking make your salad dressing: in a bowl combine your red wine vinegar, garlic clove, and dijon. Slowly whisk in your Olive Oil to make an emulsion - taste and season with salt and pepper. Once the puff pastry has turned a beautiful golden brown color, remove from the oven. 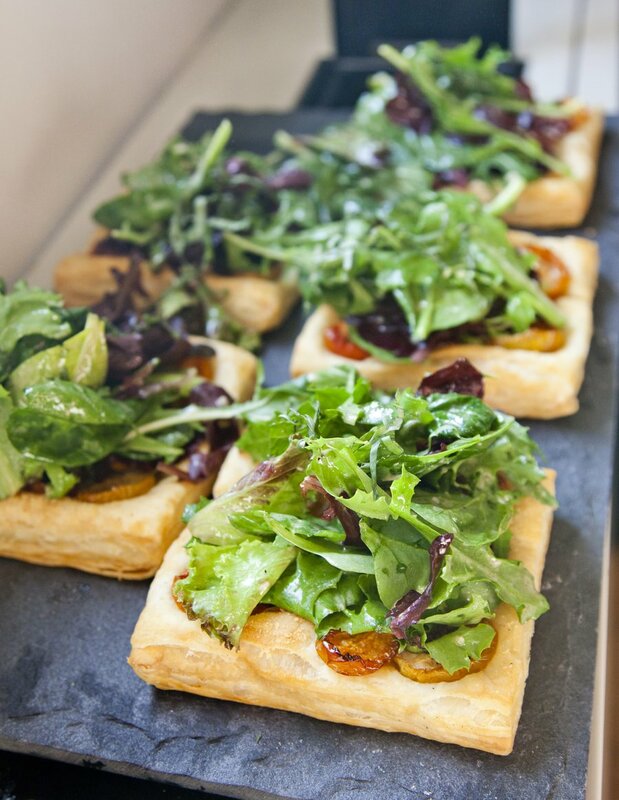 Toss your mixed green in the salad dressing and serve on top of the hot tomato tart with some fresh basil.